The author has enjoyed a long and varied career in television and radio as a writer, director and producer. His work includes the historical drama Elizabeth R, and several very successful police drama series. With this background, it is to be expected that this book is not a dry historical account, but a well-researched, unfolding drama of an enduring topic. 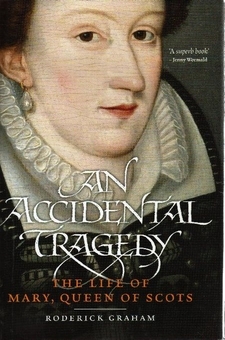 The story of Mary, Queen of Scots, has become one of those topics that inspires a stream of books. Had she not been held prisoner in England and executed, or had her son not become the first King of England and Scotland, she would probably have been known to very few. Her story is one of tragedy, but the debate is about her culpability in that tragedy. The author very ably sets out the case that this was an accidental tragedy and his work is illustrated by a section of bandw plates. Mary was one of three notable women of the Sixteenth Century. Her mother in law, Catherine de Medici was a dowager Queen of France, remembered for her ruthlessness and the dark reputation of the Italian de Medici family. Elizabeth Tudor was equally ruthless, if on occasion reluctant to reach decisions, including the decision to execute Mary Stewart. For her part, Mary is really remembered for a chain of disasters that resulted from her inability to rule in Scotland.